It’s officially fall! Cooler temperatures, bonfires, soups and chowders, hot chocolate, and apples! Lots and lots of apples. This is one of our favorite jams. 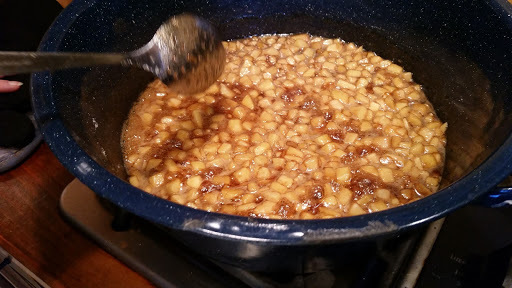 To a large stock pot, add the apples, water, butter, cinnamon, nutmeg, and vanilla beans. Cook over low heat, stirring frequently, until the apples are tender. Once this mixture comes to a boil, add the sugars. Mix the sugars with the fruit and bring to a full rolling boil. Boil for one minute, stirring constantly to prevent sticking, then remove from heat. At this point, I used an immersion blender to puree the majority of the apples. I did leave part of them whole. This step is totally your choice. If you prefer whole pieces of fruit in your jam, this step can be omitted. 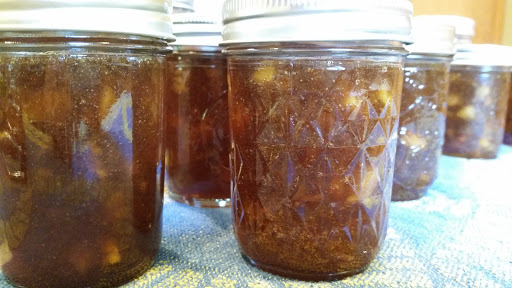 Ladle the apple jam into sterilized jars, place on the two-piece lids, and process in a boiling water bath for 10 minutes. This yielded 7 half pints of jam.